Watch the vid! Hassan Skodeng in Court. 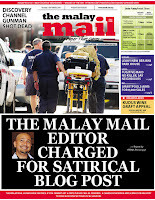 vs Hassan Skodeng case, where Irwan Abdul Rahman, 36, aka Hassan Skodeng is being charged of sending out false information on the Internet with the malicious intent of annoying another person, I said that as a blogger I was truly annoyed by the fact that the AG's Chamber or the MCMC or TNB saw it necessary to turn this into a court case. I said: "I thought only the past Administration under the previous prime minister was capable of such @#*! action. Obviously, under this Admin and this Prime Minister, we haven't changed that much". I added: "I wanted to say this is a waste of the court's time and taxpayers' money but I won't say that. (I'd say) let's hope this case will help educate some people on what satire means". 24 Nov 2010 is the next court date for Hassan Skodeng. PJ Sessions Court, 8.30 am. Mahaguru 58 told me in the court house the time has come for bloggers to unite again because obviously the "authorities are not done with intimidating us". "They have not learned anything from March 2008". Yeah, easier said than done. 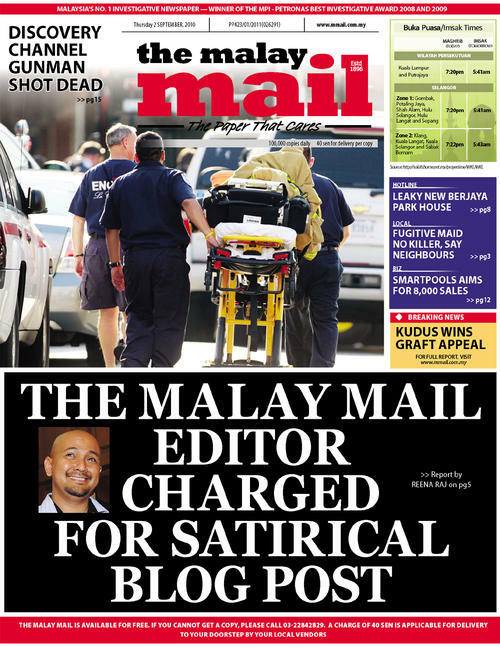 The Malaysian blogosphere is so fragmented, Mahaguru. Divided and ruled by politicians. But I'm soothed by the fact that Hassan Skodeng is determined to fight this attempt to intimidate him (I'm not sure who's trying to intimidate and who his satire annoyed - the AG, Rais Yatim the minister, or Che Khalib the mighty TNB ceo; past cases against bloggers/commenters using Section 233 (1) (a) had been against the Sultan of Perak and the Sultan of Johor). And happy to note that another blogger - Jahabardeen - will be defending Irwan against his accusers. And my own lawyer Edmund Bon has been sending tweets on how this one should be dealt with. Happier still to note that Art Harun had sms-ed to offer his services if Skodeng is without counsel, although he "doesn't usually do criminal cases". And plain happy to see some good old bloggers there this morning: Sheih Kickdefella, Syed Akbar Ali, Big Dog aka Zakhir Mohamad, Shamsul Yunus of the Marahku blog, Nuraina A. Samad, Jebat Must Die, and Mahaguru 58. Zorro I-will-walk-with-Hassan Unmasked sms-ed to say he couldn't make it. Shanghai Fish was also there in spirit. All in all, just like the good old days. Well, almost. To Hassan Skodeng, all the best. POWERRRRRR ... EXTREEEEME!!! Yaa laa.. apa kona dengan gomen,, yg lawak tu lawak jerr laa, buang masa n buang karang and make you look dumb and stoopid! come to think of it, it the Public Prosecution office or whate ever its called here who made the call to presecute? right, so who is the dumb one now? The govt masters, or the PP? Well, the time for a few bloggers to band together may or may not be upon us again. But consider the forumers, the commenters and the trolls. That's more all-inclusive, democratic and will strike even bigger fear in the hearts of (Govern)men(ts). All they need, is a platform. dan kami sekeluarga tidak akan mengundi BN selama lamanya. Well said. Bloggers power. Bloggers fist pump (and show the little fingers as that idiot who runs TNB). Yg bukan2, aku pun tak suka, Datuk. Hopefully everybody was there in spirit. Still cherish your kind sympathy (and also Zakhir) when i landed in trouble. But.... as Richard Epstein once said "Divided we stand united we fall". You classify Skodeng's piece a satire? It looks more like a schoolboy's essay that ends with: "Then I woke up and realised it was all a dream!" You may be right from your point of view that a satire is a satire, not a crime. But, what does the law say? Obviously, the AGC is acting based on the reference to some act somewhere inside the piles of our Malaysian law book. Is there a case against Hassan Sekodeng? Well, the AGC believes there is and hence Hassan Sekodeng is brought forth to the court to be charged. Well, regardless of whether the accused is right on wrong, he is still entitled to defend himself in the open court. For you to compare between the previous and the current administration is a little too much. Now we all wants no interference from the government with our judicial system (of course we too can argue that AGC is under Prime Minister's Department). So, let the law takes its course. I'm afraid the court may be charging the wrong person. Since they are taking the blog seriously, they should apprehend the red arsed baboon who posted the TNB item.